In 1886, the region’s waterways had become so central to life in Muskoka that contemporary observers were comparing its culture and mobility strategies to those of Venice. Since entrepreneur A.P. Cockburn had introduced the Muskoka Lakes’ first steamboat twenty years earlier, the area’s lakes and rivers had become the primary means of moving people, materials, goods, and resources across the landscape. These steamboats originally served a wide variety of functions throughout the navigation season. In the spring, steamers were primarily occupied towing booms of white pine across the lakes for logging companies. In the summer, they transported passengers and freight to various locations on the lakes. And, in the fall, they shipped supplies for lumber camps and other concerns. 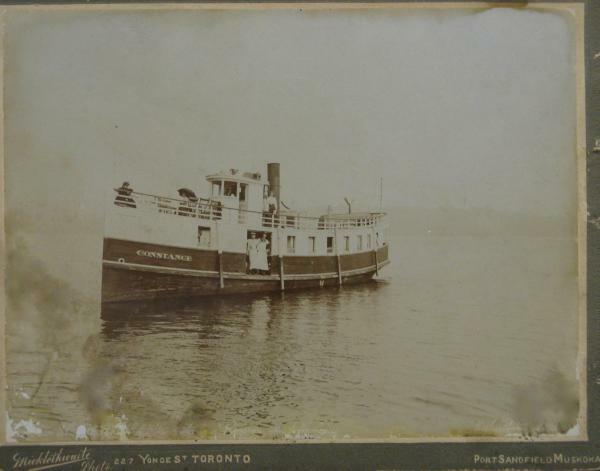 By the 1880s, however, the economy in Muskoka had become large enough to warrant specialized steamboat services. Tourism and a new brand of seasonal residents were firmly established by the middle of the 1880s on all three of Muskoka’s lower lakes (Muskoka, Rosseau and Joseph). Hotels and a handful of successful farms provided a direct physical interface between the consumptive needs of seasonal residents and the productive capacity of the permanent residents, and in many cases became the nuclei for settler-tourist colonies around the lakes. As the nineteenth century unfolded, however, dozens of cottages were built on islands and remote shoreline locations each year. Typically, these households were far-removed from the type of interface enjoyed by settler-tourist colonies elsewhere. To accommodate the needs of these isolated seasonal households, a handful of enterprising farmers and merchants adapted small and mid-sized steamboats for the specialized purpose of supplying lakeside residents. One turn-of-the-century lakeside resident described the supply boats as ‘Eaton’s in miniature.’ For cottagers who had limited personal mobility, and could not easily get into town to acquire items from the general store, supply boats brought the store to them. The most important function the supply boats served, however, was to connect isolated households with farms at distant locations on the lakes, thereby creating an indirect settler-tourist interface that effectively eliminated the separation between local production and consumption. Fresh vegetables and fruit, dairy, eggs and meat could only reliably be obtained from local sources. Yet, with few exceptions, cottagers were not mobile enough to individually satisfy these types of on-going needs. Thus, along with their fresh farm products and other necessary provisions, it was the farmers and merchants who became mobile. For the next forty years, supply boats acted as mobile extensions of particular places on the lakes. During the late nineteenth and early twentieth centuries, these community-based patterns of mobility linked landscapes of consumption with landscapes of production, sites of leisure with sites of labour, and provided a public alternative to limited individual mobility in Muskoka. 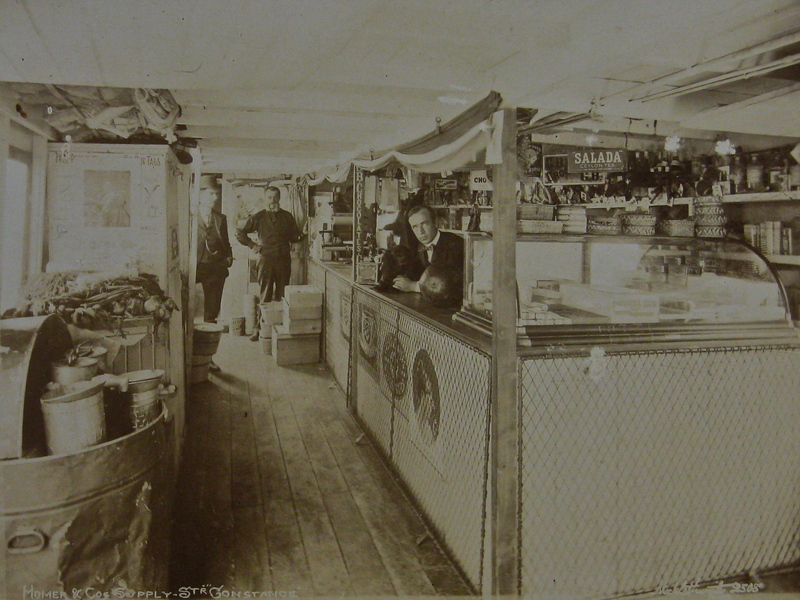 The Constance was the supply boat for a general store at the north end of Lake Rosseau, named Homer & Co. Built at Gravenhurst, Ontario in 1898, the Constance delivered provisions on Lakes Rosseau and Joseph until 1921. This shot is taken near the bow looking astern. The butcher’s counter was located at the bow, the grocery in the midsection, and the dry goods at the stern of the lower deck of the boat. Fantastic photos here. My wife’s great grandfather was a captain on one of the Muskoka steamers long ago. I find this type of history quite interesting. Thanks for the comment. The two best books on the subject are Richard Tatley, Steamboat Era in the Muskokas. (http://books.google.ca/books/about/The_Steamboat_Era_in_the_Muskokas.html?id=5MhzAAAACAAJ) and Harley Scott, Tales of Muskoka Steamboats. (http://books.google.ca/books/about/Tales_of_the_Muskoka_Steamboats.html?id=5Ad5uQAACAAJ&redir_esc=y) You should be able to find both of them in any Muskoka library.